We’ve previously discussed how lasers are a great option for clearing a stubborn fungal toenail infection and treating cases of soft tissue injury. 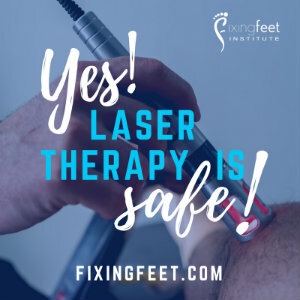 At this point, you might be considering contacting our office for an appointment, but are holding back because you’re just not sure – is laser therapy safe? Does laser therapy hurt? No. This is a painless form of treatment. At most, some patients report feeling a slight warming sensation. Does the laser damage healthy tissue? No. In the case of laser therapy for fungal toenail treatment, the laser is calibrated to specifically target the fungal spores responsible for the infection. This leaves the healthy tissue around the area completely unaffected. When we use laser treatment to address issues like heel pain, the laser’s energy does travel through healthy tissue to reach its intended destination. The good news, though, is that this does not affect those tissues. How do we know laser therapy is safe? Along with food and drug products, the United States Food and Drug Administration (FDA) is responsible for approving equipment used for medical purposes. This federal agency has examined scientific evidence (validation studies) that shows laser therapy to be safe for humans. If you have any questions about foot and ankle care, simply reach out and contact Fixing Feet Institute. Our staff is experienced and has the training and knowledge to provide the answers you seek. Even better, we provide effective care and treatment to resolve a wide range of problems for our patients. No matter if you would like to learn about any foot-related topic or need professional treatment for a painful condition, we are here to help! Contact our Surprise, AZ office online today or give us a call at (623) 584-5556 to speak with one of our friendly staff members.